Macherey-Nagel manufactures TLC and HPTLC products with layers for special separations. CHIRALPLATE is a TLC glass plate coated with a reversed phase silica gel impregnated with a chiral selector and copper ions. It allows multiple simultaneous separations of enantiomers. 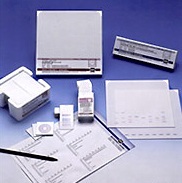 The Macherey-Nagel chiral TLC plate CHIRALPLATE was developed to achieve rapid and effective control of optical purity. The separation of optically active isomers is based on ligand exchange: the chiral selector on the plate and the enantiomers to be separated form diastereomeric mixed chelate complexes with the transition copper ion ( in the case of CHIRALPLATE). Complexes for the different antipodes have different stabilities thus achieving chromatographic separation. High performance reversed phase TLC plates (HPTLC) are manufactured by Macherey-Nagel for demanding separations and for use with TLC scanners where low detection limits and high reproducibility is required. Rose Scientific supplies all of Macherey-Nagel’s high quality TLC and HPTLC plate products, including ready to use plates with these layers: Standard silica (including SIL G and DURASIL hard surface), Unmodified silica for HPTLC (including versions with SIL G and DURASIL), Modified silica for HPTLC (including RP-2/UV254 Reverse Phase), Aluminum oxide, Cellulose (modified and unmodified), and Layers for special separations (including CHIRALPLATE featured here). Most products are available with or without fluorescent indicators. See the ordering information on the most popular Macherey-Nagel products Rose provides: Standard Unmodified SIL G, Unmodified DURASIL with a special binder for a harder surface, Reverse Phase RP-2/UV254, and CHIRALPLATE for enantiomer separation (below). Call Rose Scientific for pricing on other special separation products such as Macherey-Nagel’s glass plate SIL G-25 HR, for separation of aflatoxins or SIL G-25 TENSIDE for separation of detergents, alkanesulphonates, polyglycols, and assessment of fetal lung maturity.